The Dung Lac School was located at number 29 Nha Chung Street. The archdiocese never produced any document indicating its intention to donate, transfer or cede the right to use. The administration has started the construction site without notice and the project does not have the necessary building permits. 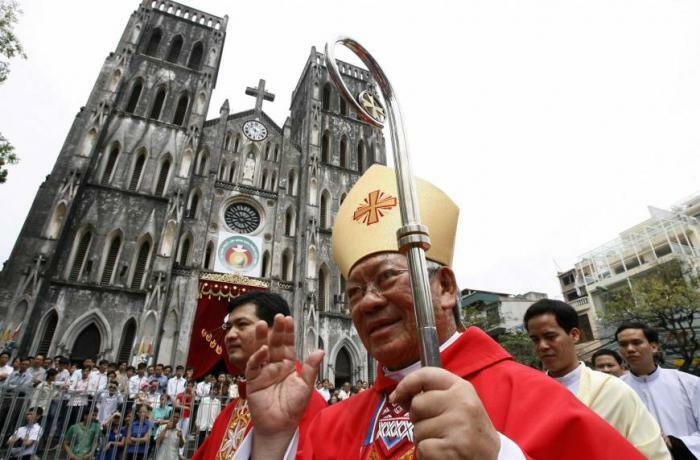 Hanoi (AsiaNews) - Without providing any explanation or the necessary documents, the Hanoi authorities have started a construction site on land belonging to the archdiocese. The Catholic community in the capital protests against the misappropriation of the lot, where once a school was built. On November 5th, the ecclesiastical authorities issued a statement. The document, signed in the name of the clergy and faithful of the capital by the Archbishop, Card. Pierre Nguyên Văn Nhon (photo), and by auxiliary bishop Msgr. Laurent Chu Văn Minh, was sent to the secretary of the Municipal Committee of the Party, to the president of the People's Committee and to the administration of Hanoi. The note states that the authorities of the capital have started a building site at number 29 of Nha Chung Street, land owned by the archdiocese as certified by the title of property no. 1794, volume 9, page 191. This is where the Dung Lac School was located, run by the local Church. Up to now, the archdiocese of Hanoi has never produced any document indicating the intention to donate, transfer or cede the right to use this lot. The administration has started the construction site without notice and the project does not have the necessary building permits. The officials purposely blocked all access to the land lot and brought heavy machinery to it, as if it were an uninhabited place.